When I first wrote this post, my brother-in-law’s Garmin Edge 500 had finally given up the ghost and he was in the market for a new bike computer. I took the opportunity to research the Edge 520 and Edge 820 in detail and consider which would be the best replacement bike computer. 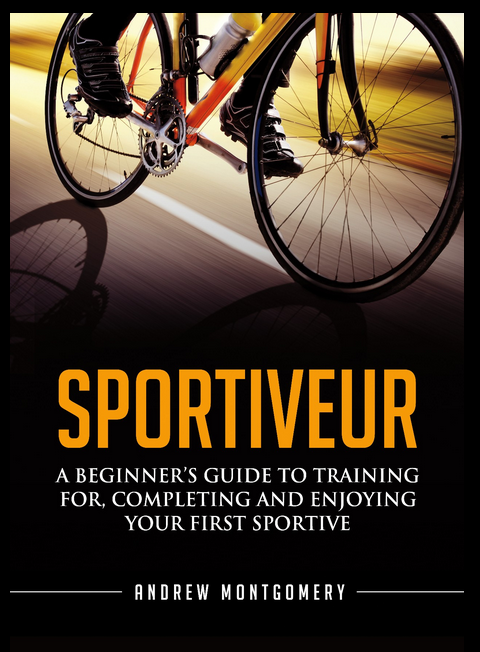 I then used this research to write this post, which you can use to help make your buying decision if you’re in the same boat (or on the same bike). I could keep you in suspenders as to which one he went for (in fact, which one the family clubbed together to buy him for his birthday) until the end of this post…. but it’s really not that exciting (whisper: we went for the Edge 520). If you want to want to find out which is best for you (and if I’ll buy you one for *your* birthday), read on (MacDuff). Come on people. We’ve been through this… A bike computer is a large steam-driven device, using valves, levers and pumps, that allows you to do work whilst riding your bike. It also calculates chess moves. Providing those chess moves pre-date 1974. 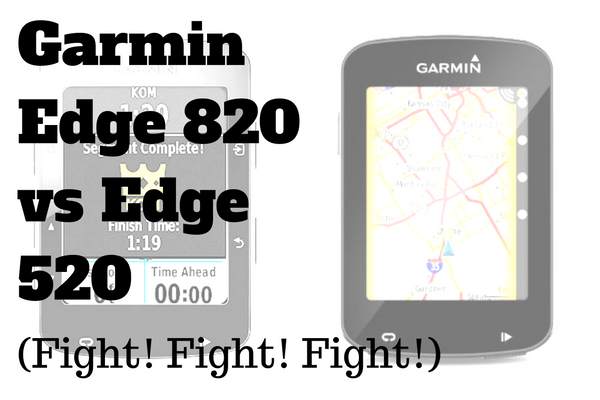 With both the Edge 520 and 820, Garmin has done something rather revolutionary in creating a small, rechargeable device that attaches to your bike handlebars, which displays and records data whilst you’re riding (speed, distance, next mortgage payment due date). All cyclists require a bike computer (that’s right, it’s obligatory). You don’t have to spend a few hundreds of pounds on a whizzbang GPS-based model though. There are much cheaper versions that measure speed and distance using wheel circumference. I digress. Back to the Edge 520 and 820. What Do The Edge 520 and 820 Have In Common? They were introduced within a year of each other (…people said they could be sister and brother…). The 820 was released in July 2016 and the 520 came in July 2015. They have been very much at the forefront when it comes to receiving new software features, as and when Garmin puts out an update. Due to their small size (see below), they tend to be the two models in the Garmin line up that pro cyclists choose between (rather than opting for the flashier, but larger Edge 1000/1030). Both devices use GPS (i.e. satellites) to work out where they (and thus you) are. This is then used to calculate speed, record where you’ve been, help you work out where to go. Back in the day, it used to be interesting to note if a bike computer used GLONASS (the Russian system of satellite positioning) in addition to GPS (the US version), because not all did. I am pleased to report both the 520 and 820 use both GLONASS and GPS, so satellite ‘acquisition’ (how long it takes for the computer to work out where you are) should be as quick as reasonably possible for both. Get this. The Edge 520 and the 820 are exactly the same size! I KNOW! That is, about 7cm long, 5cm wide and 2cm deep. I don’t think you’ll be needing a wind tunnel in order to optimise airflow over that one. But (and this is important), the 820 is 7.7 grams heavier than the 520. Both devices employ a colour (color…) screen, with Team Dimension Data of 200 x 265 pixels. The main difference with the screen is that the Edge 820 is touchscreen, where the 520 is not. The 520 is entirely operated by the buttons on the sides. It used to be that people bought GPS bike computers to get away from physical sensors on the bike (i.e. the magnet fandango set-up, used to measure speed and distance). No more. It’s all about connectivity. Such is life. The other widely-used communication protocol (I like using the word ‘protocol’) is Bluetooth Smart (formerly Bluetooth SE). Neither the 520 or the 820 supports sensors that broadcast using Bluetooth Smart (if I said that Garmin essentially owns ANT+, you might hazard a guess why). But. They do use Bluetooth (Smart) in order to communicate with your mobile phone. So, using the Garmin Connect app, you can have your ride data automatically upload to your phone (and then onwards into Strava and the rest of the ‘cloud’) as soon as your ride concludes. This magical Bluetoothery also allows you to broadcast your ride in real-time, to friends and rivals. The Bluetooth smart connection is not a one way street. Oh no. Both the 520 and 820 can be set up to display alerts when you receive important (and presumably unimportant) text messages and emails to your phone. So, at last, that final bike-based sanctuary of peace and quiet, without interruption and distraction, has finally been conquered. You can now be permanently connected to the matrix. I hope you’re as pleased as I am. The Edge 520 and 820 are both integrated with Strava’s ‘Live Segment’ feature. 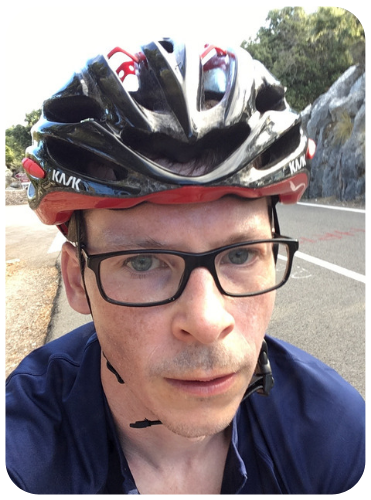 They’ll tell you when you’re approaching one of your favourite segments and then, whilst you’re riding it, provide a ‘motivating visualisation’ (nope, me neither – perhaps it shouts, “Speed the fug up you fugger”…). Once you’ve finished the segment, it’ll flash up how you did versus your previous attempts, those of your pals and (if you ride in such hallowed circles), if you’ve got a KOM/QOM (Google it…). There are some features that one finds it very hard to get excited about. It would, however, be remiss of me not to mention them. Both devices contain barometric altimeters – they’ll record how high you are (not that way), so that your ride elevation data is more accurate than relying on Strava’s underlying topography data. Okay Okay, Enough Similarities. What’s Different? Mapping. There, I said it. And to be honest, this should come as no surprise to committed Garmin followers. This has always been the distinction between devices that start with a 5 and those that begin with 8. The 820 can calculate routes on the device itself. It can re-route you if you take a wrong turn. It ‘understands’ the map (as much as a non-sentient object can). You can identify a point on the map that you want to get and it can work out a route complete with turn directions and road names. The 520, on the other hand, does not understand the map. Whilst it can display maps and give you directions, it does this simply by following a set of GPS coordinates and flashing up lines on a route card, as and when you get to each turning. The 520 will not re-route you if you get lost. Assuming it is like the 510, it’ll just tell you you’re off route and give you a general direction for getting back on it. Increasingly, high end bike computers (of which the 520 and 820 are two) are getting features that historically you’d only have found in training software like Training Peaks and other data analysis tools. So, the 820 and the 520 can calculate (or estimate) things like functional threshold power (FTP), give you information about how much recovery time you’ll require post-ride (Recovery Advisor) and (if you’ve got Garmin Vector pedals) help analysis your pedal stroke. Whilst the feature set is broadly the same for the 820 and 520, the newer 820 has a few more software-based features, including a ‘Stress Score’ test that measures heart rate variability in order to work out whether you’re ready for your next session. The ability to be tracked whilst riding your bike has been a feature of Garmin Edges for some time (it’s on my 510 and was a big feature of the promo campaign when that was launched in 2013). The Edge 820, via the new GroupTrack feature, allows you to track other riders within a 10 mile radius to help you find friends (and enemies) that are out riding at the same time. This sounds good, providing you have friends. As it stands, the 520 isn’t due to get GroupTrack (according to the esteemed DC Rainmaker, who regularly chats with the horse’s mouth). That said, whilst you can’t use the 520 to find other riders, it will allow you to broadcast your position, so those with an 820 (and, in due course, an Edge 1000) will be able to (group)track and find you. I would suggest that if you are Jason Bourne, you’ll be wanting to turn this feature off. Also, I’d suggest you don’t buy a GPS tracking device in the first place. Also, why are you using the internet? *** Update Alert *** This feature has been added to the Edge 520 since I first wrote this post so this is no longer a difference (indeed its a *similar*). I’ve left this section in to explain what Collision (or Incident) Detection is (or does) but don’t let this influence your buying decision! If you’ve had a collision on your bike, I doubt you’ll need someone to tell you (though the ambulanceman may need to remind you later). That said, you might like someone (or something) to tell people you love (or people… you… met). The Edge 820 (and 520 now!) purports to do exactly that. Through its magical jiggery pokery (accelerometers? ), it will identify if you’ve had a crash of some sort. It’ll then give you a 30-second countdown before it fires off a text message to your designated incident alert recipient. Which may or may not freak them out if it’s a false alarm and you didn’t get there in time. The Edge 820 can connect directly to, er, something (broadband? the internet?) via wi-fi. The Edge 520 cannot. It’s just another electronic pipe (as experts like me call it) that allows you to sync your ride data with the outside world (Garmin Connect, Strava, Ceefax?) and to download updates for the 820 itself. Most Importantly, What’s The Price Difference? Officially, right now at least, the Garmin website tells me that the RRP price difference for the ‘device only’ option (i.e. without the HR strap and speed sensor) is £80 in the UK and $100 in the US. It’s not as simple as this though. Prices can and do vary, based on stock levels and promotions around the world. Amazon is most likely to have the best price at any given time (and you could always monitor it using something like Camelcamelcamel*). (* Which sounds like something you would write after consuming half a pound of potent hallucinogenics). Great writing, Monty! Let us know what he eventually decides on. I’m stuck in the dark ages on my 510, but did some climbs recently in unfamiliar territory (Lake Tahoe, California) with an animal of a friend, and I was very envious of the profile data he had on his Edge 800. Basically, he could see how much of the climb was left at any point in time, whereas I had only his wheel to hang onto as the darkness descended and I tried desperately not to puke my guts out. More seriously, I think it boils down to whether your bro-in-law wants (and will use) mapping very much, and whether he likes touch screens (thumbs-down, IMHO — I keep dripping sweat on them or putting my glasses on them and accidentally invoking functions I don’t want and sometimes can’t figure out how to reverse). I wonder why no one mentions that the internal memory of the 520 is around 110 Megabytes. That’s a show stopper for everyone that likes to install Open Street Maps with a radius more than 50km.